Although the last bearer has the responsibility and gets material damage by counterfeit money, there are few counterfeit identification product to prevent the actual loss in the market. INH has challenged the market which was full of expensive expert devise with the portable counterfeit identifying product which can be easily and quickly figure out the fake money. This is called Prodetector. Prodetector will help you to enjoy your safe and enjoyable journey preventing the potential loss that you can experience in foreign currency transaction while you’re having trip abroad. These are the images of each countries paper money, and the images of infrared printing, ultraviolet rays printing and magnetic printing. More information will be updated further. 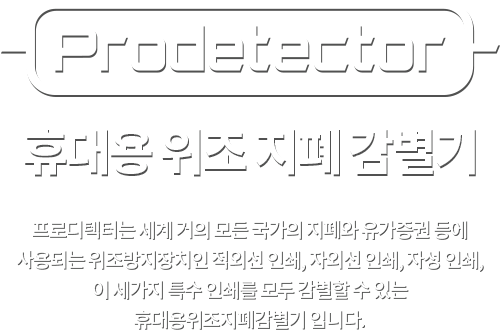 Portable multi-currency counterfeit detector, the ‘Prodetector’ has released. If you have any question, please use our contact number (+82-2-853-7497) or E-mail (inh.prodetector@gmail.com) or Q&A board.